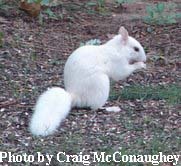 White squirrel has been around for a week now in Hershey!! If I’m squirrel hunting in Brevard and I see one that has a little white but is mostly grey, are they fair game or can I only hunt and eat the grey ones? Apologies for the delayed response. It matters whether or not you are talking about within city limits. Can you specify?